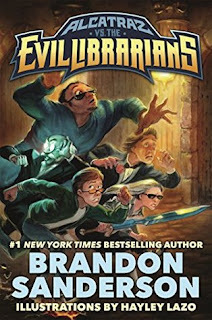 Alcatraz VS The Evil Librarians is the first book in a middle-grade series by freaking Brandon Sanderson. Yeah. Now you know why I picked these up. Though my Sanderson fangirling may have started with his adult high-fantasy, I've since become a fan of his YA work and now his MG work. Basically, if the man writes it, I'll be fangirling about it. Sooo, I take it you all know how this review is going to go now. The usual, yes? The first book in the Alcatraz Series introduces us to Alcatraz, our 13 year old boy-hero, who spends most of his time trying to convince us that he's not a hero; that he's not a good person. I will admit that the guy has his faults, and that he could be seen as a sort of anti-hero...but the word 'hero' is still in there for sure. Granted, many of his faults stem from the fact that he only just learned that what he saw as his curse is actually his own 'special power, and that there's a magic world that he never knew about. You can't help but cutting the guy some slack for making a few poor judgement calls here and there. Despite a few missteps, Alcatraz is a character that I quickly warmed up to, thanks to his narrative voice, his humor, his endearing self deprecation, and his sass. Yes, the sass is strong with this one. 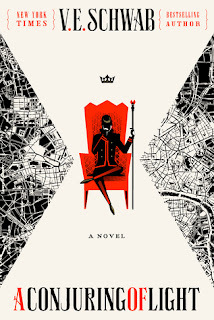 Sanderson immerses us into a quirky new magical reality, filled with odd magical powers, bigger on the inside enchantments, and a variety of magical items like glasses, swords, monocles, handbags, entire buildings, a bag of sand (can't forget that) Oh! And the title reference: evil librarians! 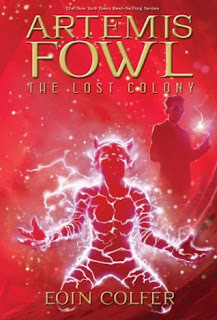 It was that combination of completely new, with a hint of Doctor Who, Harry Potter and Artemis Fowl that ended up working so well for me. It all seems random and weird when I talk about it here, but within the pages of Alcatraz VS The Evil Librarians, it just all meshed in together perfectly. To top it all off, Alcatraz VS The Evil Librarians is filled with illustrations of the characters and key scenes that are equal parts gorgeous and hilarious. It was a quick read and even though it was MG, I could see it working as YA as well, kind of like how Harry Potter started off lighter and more family friendly (if you ignore the dead parents and undead crazy guy trying to kills the hero at every turn...) but ended as a very mature YA. With 4 more books to go, I can't wait to see what kind of trouble Alcatraz and his new posse will get into next. If you like off-beat fantasy and read both MG and YA, you should definitely give these a try! 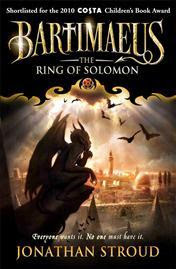 I really loved the audiobook of this one and am hoping to get a hold of the illustrated version. Man brandon Sanderson writes a lot of stuff, doesn't he? I had no idea he wrote stuff like this. And Alcatraz... what a name! LArger on the inside enchantments (always like those), evil Librarians- sounds awesome. And the 4th wall - yeah I don't always like that either, but sounds like it works here. Great review!! I have a friend who's been trying to convince me to read a Brandon Sanderson book, I have his books on my tbr! So basically I need to read Sanderson soon? Haha. I'm not much of an MG fan but I do like the sound of this one. Great review! YES PLEASE TERESSA! 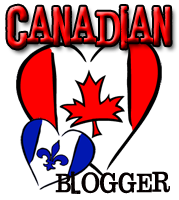 It's ok: Sanderson has YA, Adult and pretty much any age ranges available! Oh, and they're ALL EPIC :D Thanks girl! Well, you basically had me at Evil Librarians because ... well ... evil librarians. I'm glad that this was amazing - I have to convince my son to read these!